Here’s a story, a story about IBM and open-source. It is also a kaddish story. Since early in 2003 I have been a member of the team responsible for the day-to-day management of IBM’s open-source activities. When an opening came up and my name was suggested I eagerly sought the job, both because I was looking for something new to do and also because I wanted to see how a major corporation engaged with open-source as a serious business activity. One of the first proposals I dealt with was brought forward in March of 2003. Jan Willem Wissema fell ill, 2001. Last wishes on his last day — request to IBM to consider “open-sourcing” his Vacuum Cleaner work. Open-sourcing the Vacuum Cleaner has business benefit to IBM. Though one might assume that the nature of the proposal would make approval obvious, I was impressed by the thoroughness of the presentation. The proposing team met all the requirements and answered all the questions asked about proposals to start a new open-source project. The proposal was approved. I’m proud to work at IBM, because I get to work with the kind of folks who didn’t ignore Jan Willem Wissema’s request, but worked to meet it, and in so doing made his work available after his death so others could see it and perhaps even make use of it. They honored his memory. That’s why my IBM badge is one of my proudest possessions. As I have recently come to appreciate, this story is not just about IBM and open-source, but is also a kaddish story. Ari L. Goldman, a nationally recognized expert in religion and journalism, is the author of three books, including the best-selling The Search for God at Harvard. He serves as a tenured professor at Columbia University’s Graduate School of Journalism, where he is the director of the Scripps Howard Program in Religion, Journalism and the Spiritual Life. Professor Goldman came to Columbia in 1993 after spending 20 years at The New York Times, most of it as a religion writer. My wife said the book would be the first book to be discussed by a reading group at our Temple this fall. The book is about his experiences mourning his father’s death and the people who formed the community in which he mourned that death over the course of a year. It is also a book filled with stories, stories about people gathered together in that community in a process of collective mourning, a process which collectively leverages the power of the community to assist each individual mourner. After the grave is covered by earth, the son takes off his shoes, walks a few steps from the cemetery and says kaddish, for it is a prayer that renews the world. for me, kaddish was as much a chain as it was a prayer. It was a chain that in some way continued toconnect me to my parents, and will some day connect me to my children. And, finallly, mourning became a time of community. We came for prayer and we prayed, but we also talked, joked, laughed, and gossiped. We shared each other’s stories and helped dissolve each other’s pain. We became a community in the very best sense of the word; we knew that as individuals we were bound to the earth, but as a minyan we could reach the very gates of heaven. My kaddish connected me to my family, but it was empowered by my community. The story of my year of kaddish starts with me, but it derives meaning and context through the people I touched and the people who touched me every morning. The book club met to discuss the book this past Sunday morning. By a stroke of great good fortune Mr. Goldman was at our Temple that same day, to discuss his book at a “Brotherhood breakfast.” We all got to hear him speak and the book club members were able to engage with the author of a book just after discussing it. Kaddish is both a prayer and a ritual process. The Kaddish Prayer is, as Professor Goldman said in his talk, the most well-known prayer after the Sh’ma. Almost everyone knows of it or has heard it at some time, most likely at a funeral. For example, back in the 60’s, decades before I became a Jew, I recall seeing an episode of the TV series Combat! with a scene in which a soldier has just died. There’s a short part, just a few seconds long, in which a friend learns of the death, and then says the first words of the prayer, “Yitgaddal v’yitqaddash sh’meh rabba,” before moving on. Just by that I knew that both the dead soldier and his comrade were Jewish. The prayer is also central to the Jewish process of mourning, of bereavement; see Bereavement in Judaism. He gave a very moving presentation. At one point he said he had spoken many times about the book and that he could usually see the effect on the audience. I can personally attest to that in that, while I never quite cried, I came close to doing so, because of the power of the memories his words brought to mind. Where did he get the idea? He said that he was following the example of a friend of his father’s named Archie Green. When Archie realized that Allan and his brother would not be saying the year-long kaddish for their father, he decided to take on the obligation himself in memory of his friend. “I did for Deborah what Archie did for my father,” Allan said. And several years later, when Archie died and left no one to say kaddish, Allan Koznin spent another year saying kaddish, at Ramath Orah, this time for Archie Green. I started blogging quite intensively back in mid-September. Though I have thought of myself as a solitary person one of the things that has struck me is how much of my blogging has been about specific people and stories about them. But the one thing that has surprised me the most, something I would have never have thought of when I started blogging, is how many of my posts have been about me as a Jew. Aside from the book itself, has the experience of writing it changed how you write or what you write about? He responded, as best I can recall, that it had indeed changed him. He has kept a diary since the age of 19, and writes to clarify his thinking, to learn more about himself. He said he had learned much from the writing of the book, and that he had been especially moved during many of the talks he has given about the book since its publication. He asked for the name of my blog. Realizing he might actually read it, I copied back some of the posts I had spun off the the “Tracking Tom Friedman” blog, as one of them is the first in which I mentioned my being a Jew. In closing, I have often said that open-source is not just about the code, but about the people who write it. And it’s not just about the individual developers but the communities they build. And it’s not just the communities but the relationships you can build with those communities. Both Kaddish and open-source are about communities. For the last few months in my volunteer activities trying to find ways to encourage folks with open-source skills to use their skills to make the world a better place — what we Jews call Tzedakah, or Charity — I have come to appreciate that open-source is very important in that it offers new ways to make our world a better place; for example, the Sahana project I have mentioned in early posts and also in the area of education, an area which I intend to make my focus going forward. So those of us who engage in this effort should understand that what we do is not only important, but in some way is sacred, and hence we have an obligation to preserve and strengthen open-source as much as we can, so it can be used by communities yet to be formed. Jan Willem Wissema – may his memory be a blessing. 1. The Kaddish prayer is in Aramaic, not Hebrew. The two are closely related. One of our Temple members, a native of Israel, saw Mel Gibson’s movie The Passion of the Christ soon after its release. The soundtrack includes Hebrew and Aramaic; see The Passion Of The Christ – Aramaic an ancient language comes alive. She said that because of her native fluency in Hebrew she was able to understand much of the Aramaic portions of the soundtrack and that she found it virulently anti-Semitic. 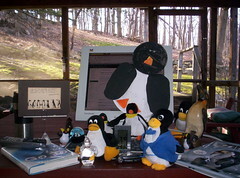 Enterprise Linux: Announcing: Enterprise-Class Support for Linux, has caused quite a ruckus . A good summary, including links to some of the press articles on this topic, can be found in Steve O’Grady’s blog post So Ellison Was Serious: The Oracle Linux Q&A. The conventional wisdom is that Oracle is firing a shot across Red Hat’s bow. Red Hat’s stock took a hit just after the Oracle announce. Haven’t seen too many folks jumping for joy, though I’m sure there are fans of the move out there. I’m jumping for joy. Let me tell you why. Now I wear dual hats in writing this blog. My day job is working for IBM, so I guess that hat is blue and not red. But in this blog I’m writing as an open-source developer, a role in which I wear a hat only to keep warm, as can be shown by my picture that can be found in the Wayward’s Author section. I need all the help I can get in that department. And as an open-source developer this announce is both a great hoot and a cause for great celebration. It’s a hoot because, as is so often the case, analyses about one company’s taking an action in the open-source arena that is perceived as having an impact on another company in the arena focus on the corporate battle and in doing so ignore the folks that in my view really matter, the developers who write the code that is the source of all the fuss. We developers just sit back and watch the salvos fly back and forth. At least some of us do. I’ve been involved in a few open-source announcements from IBM and from to time I have had to remind the marketing folks that open-source developers don’t read Gartner reports, Infoworld columns, or eWeek postings. They are too busy writing code, so if you want to reach them you have to find other venues. For example, A post from a Linus Torvalds, or Brian Behlendorf, or another key Apache developer, can have more impact with developers than all the business-oriented rags put together. Oracle’s announce is yet another proof-point that open-source has grown up. We have no more need to make the case that open-source is ready for the enterprise. IBM has been making that case for several years, and Oracle has just said they are ready , willing and able to support open-source in the enterprise. Oracle’s announce means they realized that so many of their customers are using Linux to run Oracle’s software to run enterprise-level applications that it makes sense for them to provide support. By their announce they are admitting there is no need for them to put together their own distribution — which was my guess when I first heard all the buzz about an upcoming announce — but can rely on the distribution-building skills of Red Hat. Yes, they are competing with Red Hat, but are doing so on Red Hat’s home turf, deferring to Red Hat to define the software that Oracle will support. Oracle is playing a delicate game here. If they are so successful that they drive Red Hat out of business then they may have to enter the Linux distribution business. Are they ready for that? What’s that exchange about the dog that didn’t bark? Think about it. Oracle is saying Linux is so ready for the enterprise that it makes sense to divert some of their resources that could be used to support Oracle running on Windows in order to support Oracle running on Linux. Who would have thunk it? Enterprise Windows. Announcing: Enterprise-Class Support for Windows. Oracle Unbreakable Windows is a support program that provides enterprises with industry-leading global support for Windows. Recognizing the demand for true enterprise-quality Wndows support and seeing an opportunity to significantly reduce IT infrastructure costs, Oracle is now offering Windows operating system support. Unbreakable Windows! Give me a break. Would Oracle be willing to offer enterprise-level support for Windows, installing each week the quota of security fixes, readying themselves to support the Vista that will soon be thrust upon us. The Oracle announce says they think Linux is unbreakable — would Oracle be willing to say the same about Windows? That is perhaps the key point. Oracle is saying they believe Linux can be made “unbreakable.” Would anyone, including Microsoft, be willing to make that claim about Windows? Microsoft isn’t ready to support Unbreakable Windows — they are too busy trying to figure out how to get the next version out the door — almost a decade since it was first announced. I expect so far I’ve listed at least three reasons why this is a cause for celebration in the open-source community. Which makes Oracle’s announce a Hat-trick for the open-source community. In the long run it might even be a Red Hat-trick. We shall see. 1. If you look at the URL of Oracle’s post you will find they are using PHP, an open-source technology, to power their own web site. I expect they’re using Linux and Apache too. 2. I watched Steve Allen’s TV show as a child. It was one of my favorites; he was one of the great TV comics, and a good musician to boot. He put together a great cast that included Don Knotts, Tom Posten, Louis Nye and Nanette Fabray (add links later). His wife Jane Meadows was also a great artist. 3. I’ve seen estimates that about 50% of the key Linux developers are paid to work on Linux and that they account for about 75% of the accepted contributions. Oracle’s action may not only give these developers more power to shape the course of operating system development but give them more money while they are doing this important work. And if Oracle doesn’t keep those developers happy they will move on. Which as a URL is NIGMA:email take 2. The URL ends in “ru” which stands for Russia and when I followed the link I found the site was definitely in Russia because it was in Russian. As best as I can tell by my limited Russian, someone was searching for “email take 2” using the Nigma “Intellectual Search System.” It was started about a year ago. I think it is based on Moscow. Oddly enough I spoke last night with an Israeli soldier about Moscow. He was visting our Temple. The Israeli Defense Forces (IDF) have for some time been sending some of their soldiers to our country so we can learn more about Israel. The program started in Stamford, Connnecticut, several years and this year was expanded to Northern Westchester. Our visiting soldier is about 22, though he shows the confidence of a much-older man. He has about 25 men serving under him, and has the unusual job of training dogs. The dogs can be used to search for explosives, to investigate a building, or even to save a life. He said that several months ago someone had attacked him and his dog had jumped in front him and by doing so saved his life, but had been killed in the encounter. His unit was among the first into Lebanon last summer. When he goes into battle he has no rifle, just his dog. He mentioned they found extensive bunkers, much more elaborate than anything they had imagined — air conditioners, laptops, DVD players. It took them two weeks after the end of hostilities to blow them all up. One of his closest friends was killed in the first hours of battle. He had planned to leave the army this year but had just signed up for an additional year, simply because he could bear the thought of leaving the army when he was so responsible for so many men. He took questions from the audience. Several were about security issues. He said he was quite comfortable traveling around Israel, and that 15-year olds would travel on their own to another city, rent a hotel room, and tour. He said later during a private conversation that he thought American children were much more limited and had less freedom. He also said he thought that we here in the U.S. should require a year of national service just after high school. At the end of his presentation one of our board members who had recently been to Israel spoke about how she was surprised so many Americans were afraid to travel there, that they thought it was still dangerous. After the service I had a few minutes to speak with the brave soldier, and I mentioned that my son had spent a year studying in Jerusalem. In December 2003 I had to fly to St. Petersberg, Russia, on IBM business. The St. Petersberg airport is quite small for such a large city; it’s about the size of the Westchester County Airport near White Plains. After my business was done I flew to the Moscow Airport. It was much bigger but not particularly fancy. I was struck by how few people spoke any English — I really had to use my limited Russian. I then flew from Moscow to Tel Aviv. I left around 8:00PM and soon saw only darkness below. I didn’t see any significant lights on the ground until we neared Tel Aviv. Then I saw highways, traffic, then tankers, then parked jetliners, and finally the runway as we touched down. I told him that as I was landing I had fully appreciated then that Israel was a complete modern nation-state, fully able to defend itself. 2. I once had a Russian portable typewriter made by Olympia, and at one time knew where most of the letters were. I sold it to the astronomer Fritz Zwicky. My wife worked at Ethical for a couple of years, working closely with a teacher who became a family friend. One of my favorite stories is about her early days in the 1950’s working as a teacher in Brooklyn. From time to time one of the class parents would come in to sing to the students. He was a good singer. Indeed, I’m sure he wrote most of the songs he sang to that class. His name was Woody Guthrie. 85, On October 23, after a brief illness. Born May 8, 1921 to Elmer F. and Rosina Murphy Gorel, he lived most of his life in NYC, where he worked as a printer, short order cook, oiler, elevator operator, hospital orderly and — at the Ethical Culture Society 1957-1985 — maintenance supervisor and, later, community service worker. Active in starting up many social action programs, Project FIND, SAGE, Prison Reform Task Force, homeless shelters, etc. Volunteer cook at Catholic Worker and Goddard-Riverside’s The Other Place. Studied with Institute for the Crippled and Disabled, the “labor school” of Fathers Corridon and Carey, Institute of Theology at St. John the Divine. Received Martin Luther King, Jr. Award the community service from Lincoln Square Community Council, 1985. His autobiography, “Lighting the Lamps,” was published in 2002. The title of his autobiography, “Lighting the Lamps,” brings to mind another post in this blog on volunteerism, It is better to light just one little LAMP … Please, please, help Sahana. I went to a store a few days ago. I knew the bill would be under four dollars. When I took out my wallet I noticed I had four one-dollar bills. If you had been standing nearby where you could see my hands you would have seen me do something with those four one-dollar bills. What did I do? What does it tell you about me? I asked the person who took my sorted stack a few days ago if they had to sort the bills. They said yes, it was part of their job. That’s why I do it from time to time to this day, almost forty years since I drove a cab. My doing the sort makes life easier for the person on the other side of the cash register. Because of her experience I now make a practice of yielding to truck drivers whenever I can as long as it safe. After all, they are just doing their job. Yielding to a truck driver may allow that truck driver to finish work sooner, get back home and spend some more time with their kids. 1. I’m left-handed. Do right-handed folks arrange the same way? I once saw a senior-citizen in jogging gear leave their apartment building, jog down to the next corner, cross the street and then jog into the nearest bar. No wonder there was a spring in their step. Another time, as I was driving with my wife and daugher Jen down 57th on our way to the highway, we saw a commotion outside a restaurant. I stopped the car and they went to investigate. Turns out a man had just suffered a heart attack. Jen had recently taken a course in artificial respiration (a requirement for graduating from our local high school) and was able to help out. TWWP Puzzler #1: Four one-dollar bills. But I may have found the way out, the track from obscurity to non-obscurity, a track I plan to use while there are some readers left. My most views in a single day so far were the 279 hits I got last week when I made an ill-advised post on a licensing issue that I later withdrew. However, yesterday the blog got 246 total views, 164 of which were for the “Start my engine” post. And it turns out Trackforum is a site devoted to motor sports, including the Indy 500. I find it extraordinary that only hours after I file a post about the Indy 500 my blog was discovered by a group of racing fans riding search engines across the internet, at the speed of a light, a speed much faster than the 220+ miles/hour of the best Indy racers. I also realize that what I have termed the “Tom Friedman effect” is not just due to Tom Friedman. It is but one instance of a more general phenomenon. The internet has grown so vast that if you write about almost any topic known to more than a handful of people then you will learn there is a community interested in that topic who will find you, and if they find your post on that topic interesting then they will write about your post, and so set you on another, faster lap in the race from obscurity to non-obscurity. But I also realize this is just one instance of a more general phenomenon. There are watchers — and witnesses — almost everywhere. For example, I saw a story on TV ten or more years ago about how an explosives factory in the middle of a very remote desert in Nevada had blown up shortly after noon, and the explosion was captured by a tourist ten or so miles away who happened to be filming the plant. Which means now I’ll learn if there is a large enough group of folks who film explosives plants in the Nevada desert during the middle of the day. Which equally obscure group do you belong to? Let me know and I’ll start flogging my blog on your behalf. 2. I made my first or four visits to Russia in the early 70’s. My proudest moment came when I was not too far from the Kremlin and was asked, ‘Which bus goes to Red Square?” I replied, “Bus Number 24.” At which point the interrogator said in a loud voice, “You are Bulgarian!” To which I proudly replied, “No, I am an American.” I then realized I had inadvertently absorbed part of the accent of my high-school Russian teacher, as she happened be have grown up in Serbo-Croatia. I found Russians quite comfortable with hearing Russian spoken badly. After all, at that time Russian was an imperial language, as was undoubtedly the case of Latin in Rome two thousand years ago. It you are running an empire, hearing your language spoken poorly is a small price to pay — it is a sign that you are a member of the group with real power, the group that dictates which language people must speak. 3. I took four years of Latin in high school, the last simply because the Latin teacher was such a nice guy and a great teacher. The great unknown of Latin is that no one knows what it sounded like. Was it spoken with a drawl? A twang? Did they use TLA’s (Three Letter Acronyms)?